The Bear loves horses. In fact, 80% of the time, she's pretending she is a horse. So naturally, she wanted a horse themed party for her 5th birthday. (Oh my word, my baby is 5!!) After researching horse parties on Pinterest, I had a plan. Ten 4-5 year olds. An hour and a half on a Saturday morning. Simple. Fun. Short. The kids were divided into three groups and sent to one of three stations: horse coloring pages, making a hobby horse, and a blue ribbon craft. The Bear just floated in between each station, since she thought she should be a "helper" at her party. Bud managed the coloring pages, which I just printed off from various free online coloring page sites (also found on Pinterest.) I manned the glue gun and did the hobby horses. Here is the source of my inspiration for noodle hobby horses, complete with a tutorial (so I won't reinvent the wheel.) And this is our version...with a few minor alterations. Pool noodles were from the dollar store, and each horse used one 8x10-ish piece of felt. I had the eyes and yarn. So all in all, this craft was very affordable! It helped to have all the pieces already cut out and ready to be hot glued onto the noodle. Felt can be hard to cut with kid-friendly scissors. The kids loved their horses, and as we assembled them, we talked about horses and named each of them. Some names were Scarlet, Ruth, Miriam, and - my favorite - Noodle. Super cute! Girly and my mom (the ultimate former-kindergarten teacher) ran the ribbon craft. Here's how they were made. After you stick the back circle on, the front looks a bit wrinkled. But just use your fingers to gently smooth it out like this. Before the glue dries, gently stick your paperclip in the back. This way, you can hang it on your horse. You can use any kind of shape or color for the front. You could have "#1", or "Best in Show" written on there - anything goes. Just glue the pieces on and try to keep things centered. Next just glue the two ribbon tails together and to the back. And hang it on your horse! Here are some more pics of the party set up. This is our entryway dresser. I used raffia for hey. And that is a cheap charger plate spray painted with chalkboard paint. Chalk art courtesy of Mr. Helpful. The red bowl is filled with horseshoes which you'll see up close in a second. Apples and carrots for the horses. And cupcakes of course! For drinks, we had juice pouches and lemonade. Simple simple simple! As our party guests left, they got one of these horseshoes I got for free from a local ferrier (which is the person who shoes horses - learn something new every day!) Mr. Helpful scrubbed them clean, and I made these tags in my Silhouette software. Party success! And a happy birthday girl! You know when you go to a party, and you put your name on a plastic cup so you (and everyone else) knows whose cup is whose? Well, I need to do this in my house. My kids will easily fill up the top rack in the dishwasher in one day if I don't catch them and tell them to reuse their cups. One of my latest projects solves this problem. And as usual, I found the idea on Pinterest and shamelessly copied it. It's a family coaster tray. And my first attempt at this project was for my BFF and her family. Problem solved...that is...if they remember to use it! Definitely making one for my crew too! The Bear came to me and told me she wanted her hair cut short. In fact, her exact words were, "If I don't get my hair cut short, everyone will laugh at me and think I'm a zombie." Oh to be in a 4-year-old's brain sometimes. I figured it would pass, but a week later, she had asked me a million times if we could go to the hair salon and get her hair cut short. So one morning, after spending about 15 minutes attempting to untangle the long locks, and too many "ouch, Mommy stop! "s, I caved. Off we went. I may or may not have cried when the stylist made the first few cuts. Ok, I cried. Don't judge - she's my baby and her hair is so beautiful. Still adorable. The Bear is very proud of her new do. I'm recovering. About two weeks ago, I got fed up (again) at the mass of stuff my kids leave around the house. Toys, books, rocks, socks, and everything in between. 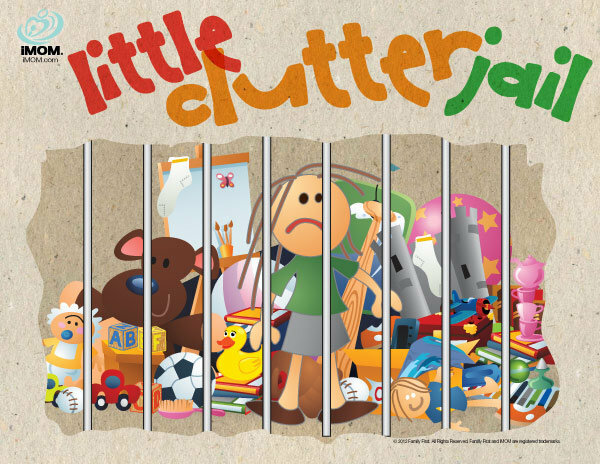 I saw a brilliant idea (on Pinterest, of course) where another fed up mom created a clutter jail. You can check out her post here. I decided to start my own Stuff Jail. So I grabbed the nearest box (no time to make it pretty - this was serious! ), printed out my JAIL sign, and explained the new plan to the kids. I gave them 20 minutes to go around the house and put things back where they belong - or else - it would end up in JAIL. They were responsible to "Post Bail" for an item in the slammer, which was a chore assigned by the Deputy on duty (me or Mr. Helpful). They vacuumed, dusted, washed dishes, folded blankets, washed windows, etc. And they earned every last thing back that same day. It was beautiful. Well, one of Buds' precious things went "missing" the other day. His IPod Shuffle. He was very upset. Really, it was sitting on the kitchen counter, but he glanced over it and missed it. So he threw a fit and blamed everyone else. Next thing I know, I find this on the refrigerator. Wow. That's quite a threat. Well, I showed him where he didn't look hard enough, but he left the note up. That was yesterday. Guess what's in jail today. His IPod Shuffle and ear buds, which he left sitting out on my desk. And, I admit, I smiled a little when I put it in jail today. Trying to teach responsibility is such a joy challenge. I see housework in Bud's near future. On the first day of Christmas break my three loves helped me bake gingerbread men. They got silly and mostly played with the dough while I attempted to work with what ended up being very dry crumbly dough. (Where did I go wrong - more molasses maybe?) They liked getting messy and sneaking nibbles of dough - which by the way, does not have eggs, so it's ok to eat raw, in case you wondered. It's actually quite good, and if we hadn't baked today we might not have had any dough left in the fridge! After struggling to roll it out smooth and cut out the little men, I gave up and we just started making gingerbread blobs and squares instead. Bud wanted to make a dog. Girly wanted to make a girl. And the Bear just wanted me to keep sprinkling "sugar" on her little pile, which was really flour. (She calls most white things that can sprinkle sugar - like Parmesan cheese and salt.) They totally didn't care how it looked, and neither did I. When the gingerbread men came out of the oven and onto the cookie rack, they looked like they had just returned from battle. Some of them just plain didn't make it. Limbs were missing. Some heads too. And any that were actually in tact were dry and cracked like mud baked in the sun. But. They still tasted great. Just like the dough. Only warm! Obviously, I am not a stickler for perfection, especially when it comes to doing anything with my kids. Why set myself up for failure? But I have yet to celebrate a Christmas without gingerbread men - or gingerbread whatever. It's funny how the family traditions we grow up with carry over into our own families - or morph into some new version that incorporates the traditions of your spouse's childhood. And then there are the new traditions that we start - whether on purpose or by accident. One of my favorite traditions growing up was reading 'Twas the Night Before Christmas with my brother and sister. My brother was always the reader, and he read every word in the book - right down to the publishing information. There were songs in the back of our book, and he read those lyrics too. Fa la la la la...la la la la. We didn't sing it. We read it. It was a silly thing he started that just stuck. Now, we still try to read it on Christmas Eve if we are together. We've even done it over the phone when we are not! Hey all! It's been awhile since I posted. We've had a crazy week of sickness in our house. Stomach bug, hacking cough, sinus infection, and now pneumonia. And yes, Mommy got sick too. I thought that wasn't suppose to happen! So that's why I haven't done anything. There has been much snuggling and movie watching. Not much crafting or creating. Maybe this week...we'll see. Who will be next to visit the doctor? I should just camp out in the parking lot. Last night we were treated to another evening of holiday concert entertainment. This time, the 2nd, 3rd, 4th, and 5th graders took the stage. The house was packed - standing room only. And the only hope we had of seeing Bud was if they happened to get him on video on the big screens - which they did a few times. Girly and the Bear hung in there like champs - they were both tired and hungry. Thank heaven for mints in my coat pocket. They saved the night. Here's Bud. He didn't have to dress up. He chose his own outfit. Same outfit as last year. We had to bribe him with the promise of ice cream when we got home, just so we could take one picture. So after one click of the camera, he was gone. And when we got home, before we were all inside, Bud was sitting at the table with a smile and a spoon. The kid loves ice cream. Can't say I blame him! It's been a busy week with concerts and Bud's slight concussion (yup - fell off the monkey bars and landed on his head.) But I've been working on a fun holiday project . More next week, but here's a teaser picture. This week is concert week for my elementary kiddos. Girly's was last night, and Bud's is tomorrow night. What is it about elementary school concerts that makes me laugh until I pee my pants cry?! So very entertaining - last night was mostly because the one kid who will obviously be an entertainer of some sort - is the son of one of my favorite friends. Cracked. Me. Up. The Bear (who insisted on wearing her Christmas dress like Girly) spent most of the concert dancing in the aisle, doing the hand motions and singing along to all the songs (as if she knows them.) People around us were watching her more than the kids on stage. Until she noticed they were watching. Then she went into shy mode and snuggled with Daddy for the rest of the show. So here are my girls. Bud did not want any part of the post concert picture taking. Out of about 20 pictures, these are the best. How on earth do you get kids to look and smile (a normal smile) at the same time? Thank you Grama for the pretty dresses! Many people travel around the holidays to visit family and friends. We were in that group this year, and took a long torturous adventurous drive to NYC for Thanksgiving last week. (Once we were there, it was great - it's the getting there - and getting home that's rough.) But this year, I took the bull by the horns. I searched for car-friendly kid activities to help us get through the 12-ish hour trip. I went to my go-to, Pinterest. Of course, I was not disappointed. There are lots of ideas on there! My favorite ones involve bingo and magnets. Oh how I love the idea of things staying put and not flying all over our car. Road Trip Bingo, compliments of Kimberly, the Homemaking Expert, is fabulous! She has six different printable bingo cards - for free! (Thanks Kimberly!) The Alphabet Search and Slug Bug games are also free at Prepared Not Scared - her travel bag ideas are fantastic! The idea for the magnetic activity tray came from the girls over at Ladybird Ln. They made several magnetic activity sets using mostly dollar store finds! So the Bear and I went on a mission to make some variation of these for our trip. We found inexpensive cake pans at Dollar General. I like these because they are deep and can double as a tray for meals on the go, so less things end up on the floor. (Very old french fries, gummies, and goldfish have formed a colony under the back seat of our van.) At the Dollar Tree, we picked up magnetic wooden letters. For $1. Love it! So I got 3 pans, and 3 sets of letters. Knowing that we take these long trips occasionally, I wanted the activity trays and games to last. So I splurged and got self laminating sheets at Walmart and laminated all of my print outs. This would also allow you to use a dry erase marker to play, but I do not want my kids in the car with an open marker of any kind. I'll stick to magnets for now. After laminating all the games, I put self adhesive magnet strips on the back of each. I just cut the magnetic sheets I had in my stash. The kids picked from my scrapbook paper and I punched out circles using my Creative Memories small circle punch. Which, by the way, is a perfect fit for those 3/4" round craft magnets. I used my glue gun to attach the paper circles to the magnets. Not sure if that was the best option - Mod Podge may give you smoother results. Next time I'll try that. Next I trimmed down an plain manilla folder and used double sided tape to attach coordinating scrapbook paper to fit the bottom of the pan. I sealed up the sides with packing tape - to create a pocket for the extra game cards. Then I attached the manilla folder to the bottom of the pan with double sided tape. My last step was to place a small self-adhesive magnetic strip on the inside of the pocket to hold it closed so game cards don't fall into the colony thriving under the seat. The magnetic letters are not that strong - they kept falling off the pan. So in an effort to save them from the colony as well, I used very random scrap fabric and some string to create little pouches to hold the letters. Side note: I often wonder what other blogging moms do with their kids while they work on all their projects. In case you were too, the Bear was right by my side. She was my product tester. So each child has their own pan, set of games, their unique color of magnet, and a pouch for letters. Do you like how I used tissue boxes and library books to prop up the pans for my photo? Nice. Ha! Everyone has their own. Everyone can identify their own. No arguing over who's is who's. Bliss. We should be thankful throughout the year, but with the Thanksgiving holiday this week, we get a friendly reminder. I am not always as thankful as I should be. My kids definitely are not. They don't grasp the concept of truly being in need. Most of us reading this don't. Thankfully. So this week, in the spirit of Thanksgiving, I am going to take a break from my computer and try to use every opportunity I can to show the kids how to be truly thankful. There is always something to be thankful for - no matter what. I love this quote I found on Pinterest (not sure of its origin) - so true. I am off this week to be with my family. To eat turkey and abnormally large portions of everything else offered at the feast. To have leftover apple pie for breakfast. To watch football. To be thankful. And to try to teach them how to be thankful too. Happy Thanksgiving! Be back next week with some fun things to share! My kids love to create, color, cut, glue, tape, etc. I very much prefer these activities to watching tv, so I try to keep their supplies handy and give them different ideas to keep crafts new and exciting. They go in and out of this closet on their own, helping themselves to what they need. They are always in a hurry to get to the next thing, so "cleaning up" is more like if it's in the closet and they can shut the door, it's good. We encourage them to put things back in an organized manner, but they're kids age 7, 6, and 3, and their standards of organization are much lower than mine. I got tired of trying to straighten the construction paper so it didn't get bent. Crayons were in the marker bin. Game boxes were missing their tops. My once neatly stacked pile of tablecloths had been stood upon to reach things on the shelf, and was now falling over, with some tablecloth edges ripped and chewed compliments of our dog. I found way too many marker tops on the floor along with scraps of paper, tracing tools, play doh crumbs, goldfish crumbs, and yes, there were a lot of dog hair clumps in there. Eww. Just being real. I decided to make the closet storage for kid stuff only. So I emptied it. Completely. And started over. I tested every marker. If it didn't work, I pitched it. I pitched hard play doh, fully-colored coloring books, sticker pages with 3 or less stickers on them, glue sticks with no glue left, 30 page stapled paper "books" with one scribble per page, and anything else that was broken or not up to par anymore. I love purging. Especially kid stuff. Don't ask me to do my own closet - I'm not ready. I have one of those plastic drawers on wheels things that was sort of organized with kid stuff. I emptied that too, carefully chose which items to put in each drawer and labeled them with my handy dandy label maker. I moved all the "grown up" games to a different closet and moved the kids games and puzzles where they can reach them better (well, the big kids can reach.) The top shelf is reserved for things that I need to ration or supervise, like extra play doh and Bud's chemistry set. I found that black over-the-door organizer at Walmart at the end of the summer when they had all their "going to college" stuff out. It holds baggies of pom poms, foam letters, wooden shapes, sponge shapes, yarn, and other craft embellishments. Ahh. Organization. Happiness. I'd like to add some shelves down the one side of the closet for easier reachability. (Yes, it's a word.) There's a lot of wasted space. But I need to live with it for awhile to see exactly what I want. There may be an update coming eventually. What's your trick to organizing kids craft supplies? And do they actually keep it organized? Happy Veteran's Day! Thank you to all our men and women who have served and are serving our country. Thanks also to their families who "fly solo" at home while their loved ones serve. I have many family members and friends who fall into that category, so hugs and thanks to you all. I hear you (Veterans and Active Duty) can eat free at Applebee's today. School is out for my kids today. Girly told me it was veterinarians day. Seems like I should teach them a little more about Veteran's Day while I have them home today. I see American Flag crafts and patriotic music in my very near future. If you're looking for things to do with your kids today, this website has some fun Veteran's Day activities for kids of various ages. Also check out this one, and here too. Oh, another thing on the list today: pull out Girly's tooth! Check this pic out - it's hanging by a thread! The other front tooth is loose too, so I bet we'll be singing "All I Want for Christmas is My Two Front Teeth" before too long! Hope everyone enjoyed the weekend! It was a gorgeous fall weekend here. I love fall. At one point, I happen to glance out the window and saw the sweetest sight in the front yard. My Guy was helping Bud mow the lawn. Or visa versa. Whatever. It was a sweet father-son moment and I quickly grabbed the camera to take some candid shots of the two guys that I want to share. Monday is usually my least favorite day. Coming off the weekend with my Guy home and no major rushing around, it's tough sometimes to stare down the week. But I'm choosing to be positive this morning, and I'm going to toss in that first load of laundry and drink my tea. Hope you have a great day! While we worked in the Bear's room, I realized that we would hear the ever-popular "That's not fair!" from our other 2 kiddos upon their arrival home from camp Grama & Pop. So, after a quick trip to Hobby Lobby (ok, I spent 3 hours in there) to pick up some accessories for Girly and Bud, I had several other projects to juggle. Girly is into butterflies. Her kindergarten class was the Butterfly class, so it's been butterflies ever since. And there's a reason I call her Girly. She is. Not sure how that happened, since I don't consider myself to model the girliness she exudes, but anyway... So she's into pink, purple, anything that sparkles. You get the idea. Here's what I found in my happy place, Hobby Lobby. I used white eye screws and fishing line to hang them at varying heights. When the air conditioning/heat is on, the butterflies "fly". Very fun. She was also having trouble reaching her shirts hung in her closet, so I added a lower rack and one of those hanging cubby things. Pink, of course. I gave her a small laundry basket for her dance costumes. Her dollhouse lives in the closet too, and all the accessories to that have their own bin. Those 3M Command hooks came in handy to hang her bags. So many bags! She loved it! She also loved the board & batten in her sister's room. So, that's on the project list. Girly wants her room painted a light turquoise blue above the b&b. I can deal with that. I was afraid she'd ask for purple, which is almost as gag-worthy as pink in my book. On a wall - it can just be too much for me. Check back next week for a look at Bud's fisherman room accessories! Have a great weekend - don't forget to turn back the clocks! Sadly, there were only two Almond Joys in the mix, my personal favorite, that no one else in the house likes. Yum! So now, the kids will get candy in their lunches (my apologies to their teachers), and probably after school, and maybe for dessert. Until all the devil food yummy treats are gone! And so my self discipline and self control continue to be tested. Do you ration your kids' candy until spring? Do you send it away? Do you eat it? Do you let them eat as much as they want until it's gone?